"Many saw evil. They dared to stop it." 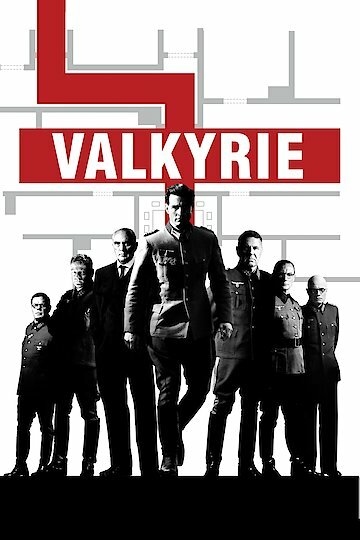 Valkyrie is a 2008 action film about a group of renegade German officers who plot to kill Adolph Hitler. Directed by Bryan Singer, Valkyrie sheds more light on the plot led by Colonel Claus Von Stauffenberg, which was largely unknown even to Germans for several decades. After Colonel Stauffenberg (Tom Cruise) is badly injured in a Tunisian raid, he is returned home to Germany. During this time, a secret resistance organization led by Major General Henning Von Trecskow (Kenneth Branaugh) attempts to assassinate Hitler with a bomb on his private plane; the bomb fails to detonate. Stauffenberg is recruited into the organization, which includes General Ludwig Beck (Terrence Stamp) and Dr. Carl Goerdeler (Kevin McNally). After several months of planning, Operation Valkyrie is launched. Its success will rely heavily upon the mobilization of the Reserve Army. On Goerdeler's orders, Stauffenberg takes a briefcase with a bomb to Hitler's command bunker, where a conference with high ranking German officers will take place. While the bomb is being placed in the bunker, General Olbricht (Bill Nighy) orders the Reserve army to stand by. After the bomb explodes, Stauffenberg and his adjutant quickly leave without confirming Hitler's death. Olbrict, who also has not received confirmation, refuses to mobilize the reserve troops. Olbricht's indecisiveness turns out to be the death knell for Operation Valkyrie. Colonel Mertz Von Quirnheim (Christian Berkel) forges orders to mobilize the Reserve Army. Now that Operation Valkyrie is in full effect, Stauffenberg orders the arrests of SS members and leaders of the Nazi Party. Confusion sets in as lower-level officers are sent mixed signals. Just before Joseph Goebbels is arrested, he receives a call from Hitler, thus confirming he is alive. As word spreads, German officers and SS leaders are released and resistance leaders are arrested. Several conspirators, including Stauffenberg are executed by firing squad the same night. Over the next few months several others are tried, convicted and executed. Operation Valkyrie was the last of several attempts to assassinate Hitler. Valkyrie is currently available to watch free on The Roku Channel, YouTube and stream, download, buy on demand at Amazon Prime, Netflix, Amazon, Vudu, Google Play, FandangoNow, iTunes, YouTube VOD online.